READ 420 Author Studies: But I HATE History!!! Do you dread discussing the Civil War in Social Studies class? Do you detest having to memorize the numerous dates, eras, and periods of various events throughout our history? Do you sit around wondering who had the hair-brained idea to name the Great Depression after the word "great", when it wasn't really great at all?! If you share in my loathing of all things "history", then have I got an author for you! 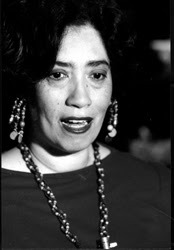 Patricia McKissack. That's her name. Plain and simply an author that will change your mind about what you think about history. Patricia McKissack will make history come alive for you! This Newbery Medal and Coretta Scott King Award winning author does this by writing about real historic events, but as seen through the eyes of fictional characters. This genre is called historical fiction. When reading historical fiction, we get to walk alongside the main character through any trials and tribulations they may face, which is much different than just reading about historical events and the infamous names of those who took part in them. Patricia McKissack was born Patricia L'Ann Carwell in the southern town of Smyrna, Tennessee on August 9, 1944. Her family moved North to St. Louis, Missouri shortly after her birth, which is where she spent the early part of her growing-up years. When Patricia was twelve, she moved back to Tennessee and developed a very close friendship with a boy named Fredrick McKissack who, many years later, would become her husband. Patricia and Fredrick attended Tennessee State University in Nashville together, and married the same year that Patricia graduated with a Bachelor of Arts in English in 1964. Patricia enjoyed a career as a teacher for several years before returning to St. Louis, now a mother of three, with her husband and sons to further her education at Webster University. She received her Masters in Early Childhood Literature and Media Programming in 1975. Patricia then switched careers and became an editor of children's books. She liked what she did for a living, but she wanted something more. Patricia's husband Fredrick knew this about his wife, so one day, as the two of them sat alone in their car, he asked her: "If you could do anything you wanted in this whole wide world for the rest of your life, what would you do?". Patricia answered: "Write books." And from that point on, with the help of her husband, that is exactly what she did. Patricia quit her editing job and her husband Fredrick quit his job as an engineer in order to pursue a writing partnership that has produced nearly 100 books....and counting! One of the primary reasons that Patricia desired to become an author of children's literature was because she felt that there was such a limited amount of material available to children that discussed the African American culture or their contributions to society. Both she and her husband, who grew up during the Civil Rights Era, sought "to enlighten, to change attitudes, to set goals - to build bridges with books." Though Patricia has relied on her own memories for some of the material of her books, she also thoroughly researches her books before writing them so that the material will be as authentic as possible. For example, with her book Christmas in the Big House, Christmas in the Quarters, Patricia and Fredrick McKissack traveled to Virginia for their research of a real plantation for this story that is set on an 1859 Virginia plantation. Patricia has actually seen the slave quarters that she describes in the book, and because of this, it becomes all the more "real" to the reader as well. Before writing fictional books, Patricia wrote mostly non-fiction books and biographies. She often tackled "controversial topics, such as racism", but did so in a way that invited all readers, regardless of their cultural background, to read (and to learn). And though her original goal was to produce writing that introduced children to "African and African American history and historical figures", Patricia has since branched out to writing the accounts of some Native-American tribes, as well as also writing about the Holocaust. Patricia McKissack really is an author worth getting to know. Following this bio will be a critical analysis of two books that I have selected: Run Away Home and A Friendship for Today. Click here to visit Patricia and Fredrick McKissack's Biography Writer's Workshop. This site will not only teach you how to research and write a biography, but will show you how to publish it!